Air quality in Idaho right now is the worst in a generation in many places, and we’re not even speaking of places immediate to the fires. Three fires in particular the the biggest smokers. The Halstead fire north and northeast of Stanley and the Trinity Ridge fire, continue to expand and burn a lot of standing and downed timber — heavy fuels that will at best smolder well into October, maybe November. The Halstead fire is burning down (eastward) the West Fork of the Yankee Fork of the Salmon and the mountains to the south toward the main Yankee Fork. On Aug. 17 evacuation of the Yankee fork right from its mouth at Sunbeam all the way upstream was ordered. We have written about these fires extensively in the past. Currently Trinity Ridge seems to be making the most dangerous run. It is over 80,000 acres in size. The fire is threatening its first town — Featherville, Idaho. This afternoon, August 18, ‘the Elmore County Sheriff ordered an immediate evacuation of the Featherville area from Featherville to the Paradise area because of thick smoke and reduced visibility due to the Trinity Ridge Fire. Pine Featherville Road is now closed to all but Fire and emergency traffic.” This is a vacation town with about 900 structures, mostly second homes. 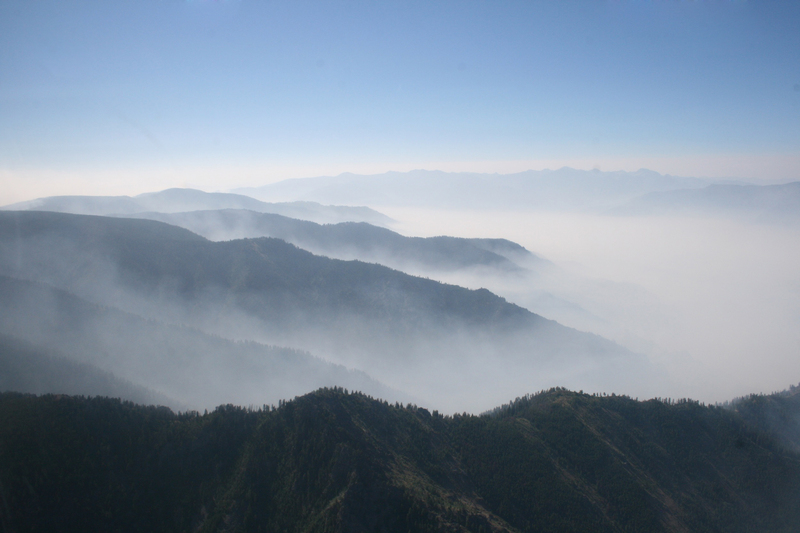 The Mustang fires are now burning over 85,000 acres of the steep Salmon River Mountains, filling the deep Salmon River canyon with choking smoke in the mornings before it billows out to the east and southeast as the morning inversion breaks up. Most of the firefighting originally consisted of keeping the fire from burning down into the canyon and destroying structures. Now, however, the fire has burned down into the canyon to its bottom all the way to the bank of the main Salmon River in many places, and could jump it to begin burning the south bank of the canyon and up into vast Wilderness area beyond. In addition to these 3 fires, others currently of lesser note in Idaho are smoking hard, e.g., the Springs Fire and Lost Packer Fire. It is also essential to add that an often thick stream of smoke is being lofted from northern California fires and Northern Nevada and SE Oregon fires into Idaho.The long term story ought to be what an immense change has been wrought in the ecology and scenery of central Idaho from wildfire over the last 20 years. Interesting satellite images. Going back to winter 2011, doesn’t seem like this area gets much in the way of snow. According to satellite date at weather.com, these areas might receive some rain today and tonight. Oops. “Date” should read “data”. Thanks for the great info Ralph. I am greatly saddened because these are our very favorite camping and fishing areas. I am sure it will eventually work for good for the forest as a whole but I fear that in my lifetime it will never be the same. Maybe some of the large trees will be left standing as they have survived in other fires; one can only hope. Could you please update us on the elk, deer and other animals fleeing the fires? I haven’t heard anything about animals fleeing the fires. Large mammals usually do pretty well getting out of the way. The acute effects on them come later, during the winter, spring, or summer of the next year. Then there are the long term ecological changes. Central Idaho has a huge amount of recently (within the last 20 years) burned country. Ten to twenty years from now much of it might become prime elk habitat. That is what happened with the great north central and north Idaho fires from 1910 to 1930. There are many things that need to be investigated. The fire is 14 miles from where I live. In the last few days we have seen a herd of elk right in a meadow near our house, and many deer. We see a few pass through on occasion but never in these numbers. Smoke and fire must be moving them out. Thanks for the update. This kind of observation can be just as interesting (probably more interesting) than a news report.